icture this – you’ve spent the day taking photographs or filming footage, channeling your inner filmmaker. You sit down ready to check the fruits of your labor, excited about the professional results you’re sure to see. Then, disaster! Instead of beautifully shot images and video, all you have is a collection of wobbly images and shaky footage. Sound familiar? The solution is simple, DSLR shoulder rigs. DSLR cameras are designed to be light, making them great for use over an extended period of time. However, they’re not the easiest to deal with for handheld shots or footage. Without using any of the brilliant DSLR shoulder rigs available, it’s likely your images will be vulnerable to the effects of the day. Making them turn out shaky or unfocused. In the old days, cameras were much bigger. This actually played a valuable role in stabilizing hand-held shots. However, even those old-school cameras were often shoulder-mounted to stabilize the shots even further. Shoulder mounts are dynamic pieces of equipment which move along with the operator of the camera. Unlike a tripod, filmmakers can easily move around and make every movement efficient to the shot. The hand-held approach to filmmaking might work for certain types of footage, but it certainly isn’t a one-size-fits-all approach. If you want your work to look like The Blair Witch Project, shaky filming might be the answer. However, if you aren’t going for that, DSLR shoulder rigs will solve the problem admirably. As you might imagine, not all shoulder rigs are fantastic. We’ve made it easier to decide on the right one for you so that you can avoid making an expensive mistake. Check out our list of the top 13 shoulder rigs on the market today and find the ideal one to suit your next filmmaking project. What are the main benefits of DSLR shoulder rigs/ mounts? DSLR shoulder rigs or mounts aren’t needed by every filmmaker. Not all projects have a need for them, to be honest. However, most of the top people in the business will have one or something similar to do the same job. A shoulder mounted camera is perfect for a number of things, but it often can help deliver a proper narrative viewpoint. This puts the viewer right in the middle of the action. Think war or action movies, where we’re seeing the fight sometimes from a near point of view appearance. The viewer goes from spectator to part of the actual scene. DSLR shoulder rigs can ensure the camera’s proper can movement by helping it capture video or images in a controlled way. Energy is present in the scene, giving an additional frantic element to major, climatic moments. Shoulder rigs, as we mentioned slightly above, are perfect for action shots. They offer the stability you need for mobile and speedy shots. Tripods and monopods are unneeded here, and you feel closer to the action. Thanks to their anti-shock, sturdy design they stabilize even the shakiest hands. 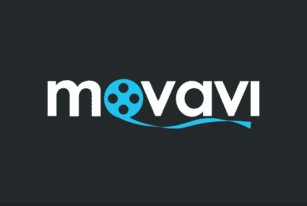 This offers smoother-looking videos that are completely flicker-free. As an added benefit, they distribute the camera’s weight evenly over the shoulders for longer shooting sessions. This is due to the ease of making things less difficult on the cameraman, making them less tired. Carrying even the lightest DSLR camera around for extended periods can be tiring, and a shoulder mount eliminates that problem for a more pleasant shooting experience. When you invest in a shoulder rig, you won’t have to worry ever again about shaky and wobbly footage making you look like an amateur. You’ll enjoy wonderfully smooth shots that are precise, well-focused, and professional. What are the different types of shoulder rigs/mounts? Not every shoulder mount is designed for the same camera or even the same purpose. The two main types are offset shoulder mounts and straight shoulder mounts. Due to what each can do and why they are both important, we felt it would be best to go over them with you. DSLR shoulder rigs are incredibly useful, but you often need to know your way around the best. Even the greatest shoulder mount will cause the user some trouble if it’s the wrong thing. It might also not do well for certain people if the type they use is fine for the camera, but not for them. That said, let’s check these different rigs out. Offset shoulder mounts are ideal if you’re using a DSLR with an LCD monitor that opens up sideways. This will allow the viewfinder to remain in front of the eyes of the operator instead of beside them. Overall, the viewfinder often makes a huge difference. The reason this is so important to keep in mind is due to how you’re seeing the action. Trying to record something you cannot see can really be troubling. Offsets allow you to see everything like you normally would through a camera. Offsets also are known for being used in a handheld fashion, like on the ground with a camera operator running or walking with them. These are what you may call the “mobile mount.” Though both are mobile, the offset’s viewfinder ability makes it less complicated to use in this format. If you use a straight shoulder rig for the same type of camera you’ll find the viewfinder is offset to the side. This can make it harder on the camera operator, as they’ll have trouble viewing. On the other hand, if you really like this set-up than you can easily use an off-camera monitor for your DSLR. You’ll also be able to place your monitor into the hot shoe mount of the camera as well. However, the most common way to use one is on a rail support system. This will allow you to get the shot, but you’ll be immobile as you’ll need the rails to push a dolly support-type of thing with you on it. This can be great for shots, however. 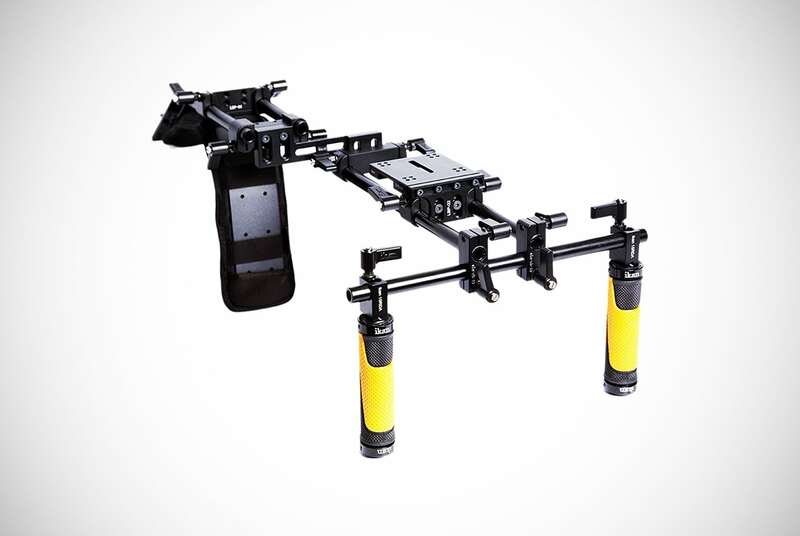 These types of things are cheaper than an entire dolly set-up, so it can be a cheaper option to get the same results for independent filmmakers. However, if you’re using a huge studio, the huge dolly set-up won’t even be a discussion. It’ll be there. Shoulder mounts come in several designs. Some have flat metal surfaces that allow the camera to be attached to the top. As we referred to above, some have a rail system. While the right one for you will depend on your own preferences and filming style, the rail system is often considered to be better since it can be adapted to more shooting scenarios. Also, a rail system can be added to over time. Adding on attachments is much simpler with a rail system and if you’re likely to need accessories like lens support or follow focus, a rail system will suit your needs perfectly. Not every type of shoulder mount can carry the same amount of weight either. Even a small and apparently light DSLR camera will become heavy over time. Especially once you attach a telephoto lens or other accessories to it. The longer your shooting session, the heavier your camera will start to feel. If you want to avoid the strain of carrying a rig, camera, lenses, and attachments, you might want to consider a type of mount with chest support or arm. The arm will rest against the chest of the operator, and this helps the camera’s front to be supported. 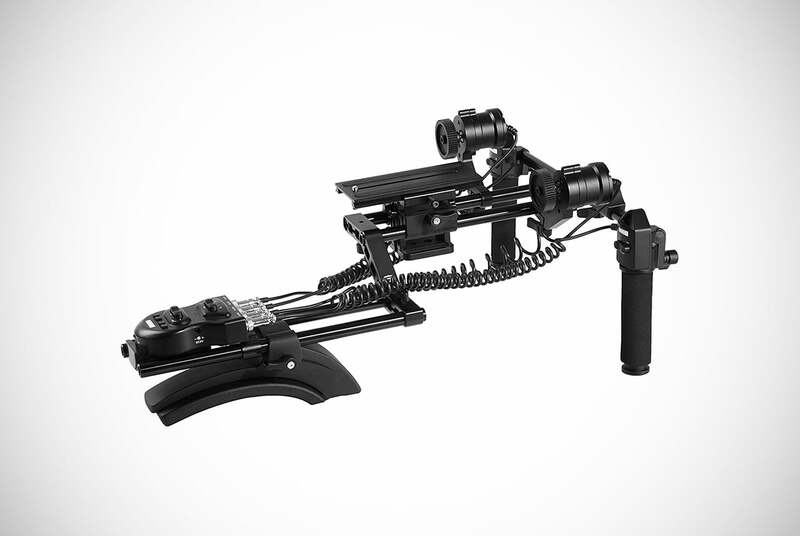 Many DSLR shoulder rigs are also supplied with a choice of counterweight options. When you add batteries, monitors, lenses, and microphones to your shoulder rig, it will start to be front heavy. You can combat the imbalance in weight by attaching weights onto the rear of the rig to rebalance it. What are the major mistakes people make when buying shoulder rigs/mounts? DSLR shoulder rigs won’t just make you look like a professional, it’ll also help to improve your stability during shooting. This is a simple fact of film-life for directors and camera operators alike. You’ll be able to film effortlessly for long periods of time without experiencing any aches or pains in your arms and/r hands. However, if you buy the wrong shoulder rig, you’ll end up causing more problems than you solve. Let’s take a look at some of the mistakes that filmmakers commonly make when choosing a shoulder mount. DSLR shoulder rigs are versatile devices, but if you’re going to get the most out of your purchase you need to consider the material it’s made with. Some are made from steel, which is very durable and long-lasting. On the other hand, it’ll be heavy to handle for extended periods. An aluminum rig is going to be just as durable but will be much lighter and easier to carry all day on a longer type of shoot. This makes it a much better choice. It’s also worth looking out for a powder coated rig since it will be corrosion and rust-resistant. This makes it ideal for outdoor shoots. We keep talking about the rail system, but that is simply due to the importance it has. The primary concern it’s for is the stabilization of your DSLR camera. If it has been well designed, it will make your shots stable even if you aren’t as skilled as you thought you were! Make sure that you select a rig that has a good rail system with a diameter that properly fits your DSLR. 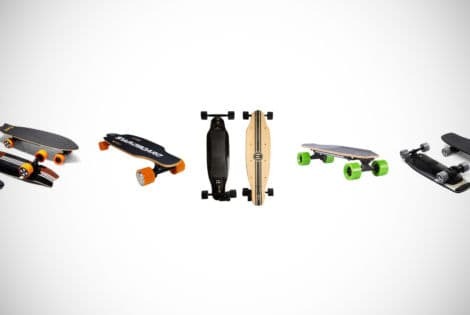 You also want it to be made from a durable material like carbon fiber. If you make the mistake of choosing a rig with a poorly designed rail system, you’ll be throwing your money away. Simply put, the stabilization won’t be good enough to ensure smooth footage. Meaning you need to look out for this big time! When buying your rig, look at the placing of the matte box. This is essential for securing your lens filters, something you’ll obviously want to to do. If you’re planning on using these accessories, you need to ensure that your chosen rig’s matte box is in the right spot for you. The role it plays is pretty crucial to the safety it can provide, of course. You’ll want to make sure that it can accommodate the type and size of filters you’re planning on using. People often buy stuff like this without considering the stuff they’ll use. Before you do, make sure you have a list of what all you’ll need that should fit into one of these. Follow Focus is a relatively big deal thing to consider, but what is it? This first needs to be described going over what type of focus people like. Some camera operators like when their camera auto-focuses. Basically, it focuses on the type of shot it will need to do in order to get the complete focused image without blur anywhere. If it does, it typically gets everything in front of it with blur only happening at distance images. Meanwhile, other operators like to manual focus. Meaning they do not want an auto-feature affecting the type of image or video they’re working on. They want complete control. They want some blur at times or some far off look. Perhaps they want to focus on closer objects than an entire image or a further one while they’ll unfocus the front objects. It’s truly up to them. Mounts will be big to consider here because they can be in the way of trying to focus your camera. If you cannot reach in easily to focus the camera during shoots on the fly, it can really be annoying for these types of people. Auto-focus types won’t care either way. One of the primary reasons to buy a DSLR shoulder mount is to make shooting videos easier. If you buy a rig that isn’t easy to use, you’ll be wasting money. Choose a lightweight rig is simple to use in whatever environment you’re going to be filming. Make sure the design is well-balanced and has all the essential features you need to get the most out of your filmmaking. You’ll be golden when you do. If you struggle when attempting to use any DSLR shoulder rigs, then this could be an issue. You want a user-friendly approach. You’ll be using these things a lot, of course. That means you need the best for you that YOU can operate easily and won’t cause you any grief. What kind of camera will you be using for your filmmaking? If you’re planning on using a larger model you’ll require a shoulder mount that’s able to effectively balance that extra weight. Otherwise, you’ll find it difficult and awkward to handle your equipment, especially on a longer shoot. Balance can be a huge asset to consider for a ton of reasons on top of this. Think of the word itself, as well as what it means. You’re balancing. Imagine having one side with too much weight on the right or left. It can really do a number on your body but it’ll also look bad when you look back at the footage. It’ll be tilted! You want even distributed weight for sure. 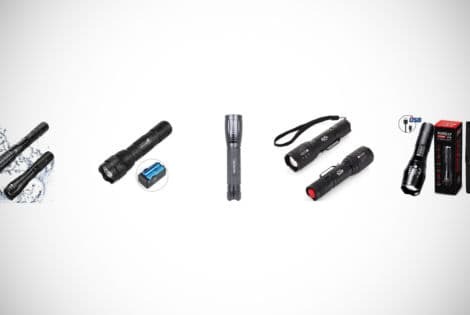 Planning on adding accessories like battery packs, microphones, and monitors to your set-up? You’ll need to make sure that your chosen rig can accommodate them. Most DSLR shoulder rigs can hold up just fine to a lot of add-ons. However, some can only handle so many. If you can take away or add on features while you’re out on a shoot, your shooting experience will be better. Overall, you’ll want to have things close by. This makes things easier in every way, so you’ll want a rig that can handle this. However, again, the biggest thing to consider is simply the amount of the extras and even what these add-ons might weigh. The Ikan ELE-OFLY is a great choice for both professionals and amateurs on any project they might be working on. Its soft padded shoulder support is comfortable to wear. It’s surprisingly light on your shoulder even for extended periods of filming. Meanwhile, the rubber handles are comfortable to hold and ensure the best possible grip during use. Designed for use with DSLRs, this mount fits perfectly in its frame, offering top quality, reliable performance. 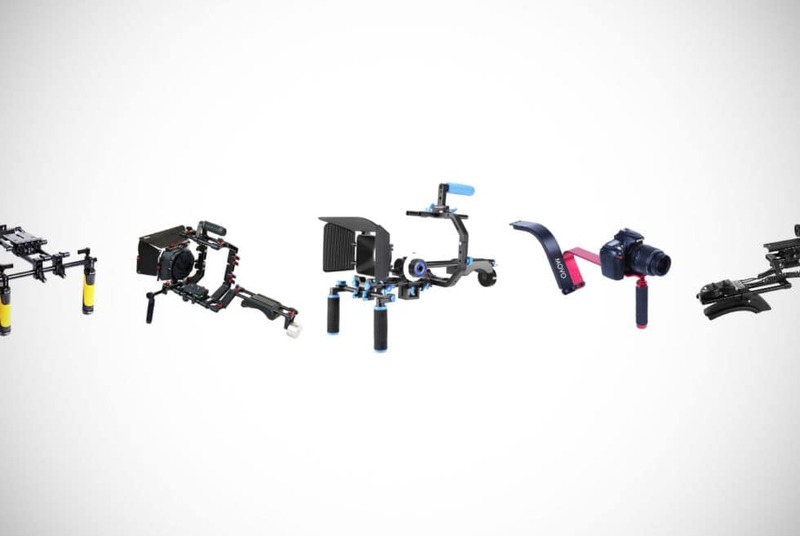 These DSLR shoulder rigs truly come with all the features of a professional rig. Best suited to small and mid-sized cameras, it can be adjusted easily to obtain optimal comfort even when shooting from unusual angles and heights. If you’re a beginner, there’s no need to worry about getting to grips with the ELE-OFLY. It is very intuitive and user-friendly, making it an easy rig to operate. On top of this, it only requires minimal assembly, so you can put it together without much of a challenge. The 15mm rods also allow for vertical adjustments to keep the camera at the perfect height for you every time. Solidly constructed from anodized aluminum, this rig is durable and strong while also being light enough for extended use. Overall, this makes it quite useful for all kinds of projects you might need it for. 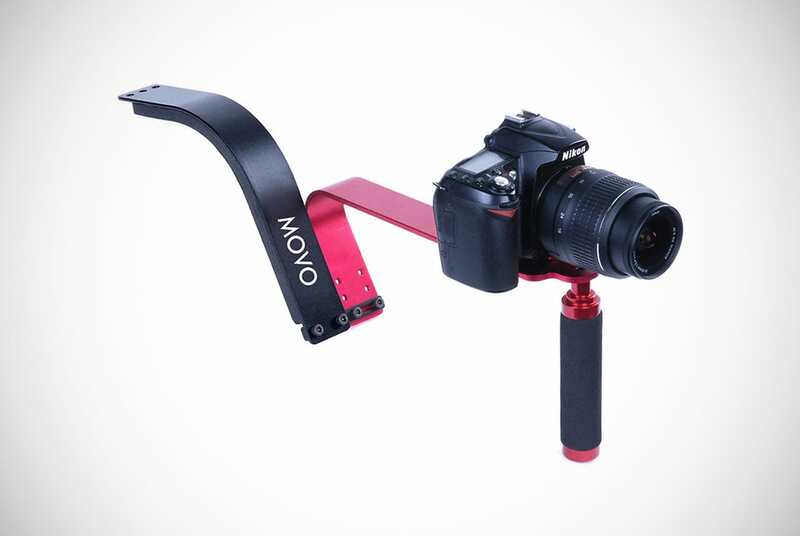 The Premium motorized Movo MFF400 shoulder mount is compatible with virtually all DSLR cameras. It’s ideal for either professionals or amateurs to use, making them a universal product to have for either. Strong enough in construction to last for the long haul, this well-designed model contains highly durable, premium motors. Together with zoom memory, it allows for smooth photography and a more precise and accurate focus. You’ll be able to use these DSLR shoulder rigs all day long and still enjoy smoothly operating motors. Boasting silent operation, this mount gives you full control over every shot. It truly could not be easier to use. This is thanks to the speed settings on the control switches that are placed in a highly accessible location. It comes protected by a one year manufacturer’s warranty and has a very affordable price tag for peace of mind. From the terrific and high-quality Neewer brand, these DSLR shoulder rigs are the perfect thing to have for any filmmaker. It comes standard with a follow focus, matte box, and shoulder mount itself. Overall, this gives you complete flexibility to shoot indoors or outdoors while maintaining ultimate portability. Designed to be entirely gear driven, it ensures accurate, slip-free movement. Meanwhile, its adjustable locking system ensures the perfect comfort and functionality every time you pick up your camera. 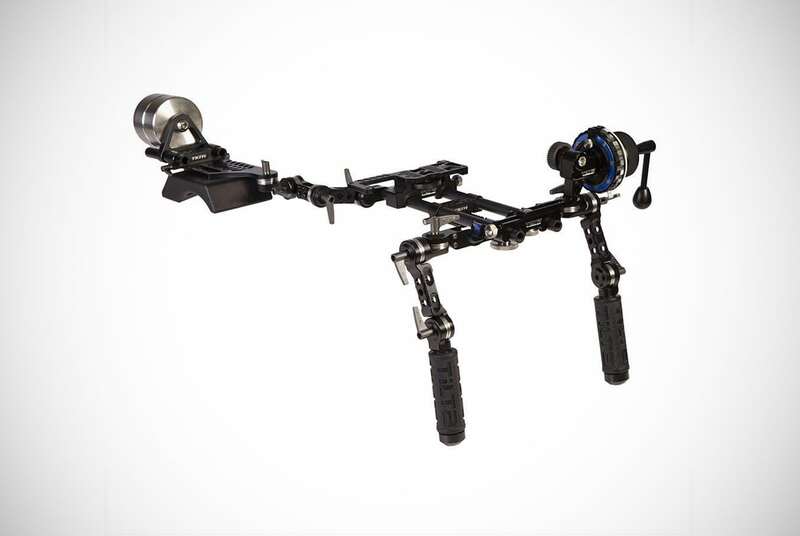 Thanks to its flexible design, it couldn’t be simpler to adjust this rig to different shooting modes. On top of this, the handgrips and shoulder mount are well padded for comfortable shooting even over long periods of time. Capable of supporting a maximum lens of up to 77mm, these DSLR shoulder rigs are made from ABS and anodized durable metal for lightweight support. All of this makes it designed to stand the test of time. You can even mount the gear drive on either side to suit your needs whether you are left or right handed. Back yet again with the Neewer brand, we know they can kill it when it comes to DSLR shoulder rigs by now. 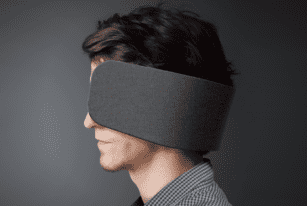 They do it again with this product, which came to the shock of no one. These highly portable DSLR shoulder rigs make filming outdoors a breeze. Its lightweight frame makes it easy to transport wherever you need to go and its maneuverability is outstanding. It can secure the majority of DSLR brands while its sturdy construction stabilizes even the shakiest hands. Its handles are well padded with foam for extra comfort during long shoots. Meanwhile, the comfortable and broad shoulder pads ensure that you won’t suffer from any pain while filming. There’s also plenty of room on this rig to add on any accessories you need. Its ¼” universal screw holes are ideal for supporting virtually every camera with plenty of space for add-on lenses and accessories. Made from highly durable and strong aluminum, this is a lightweight product that is still built incredibly. SunSmart comes into the batter’s box with this stabilizing shoulder mount that ensures you can film completely shake-free. It can be easily adjusted to accommodate your height and can even be mounted with a follow focus to allow for even more accurate focus control. Constructed to withstand heavy-duty applications, these DSLR shoulder rigs are made from stainless steel and aluminum. Its ¼” universal thread means that it can easily be mounted onto a standard tripod for even greater flexibility. With its gear-driven design, this shoulder rig ensures accurate, repeatable, and slip-free focus movement. Its adjustable slide-mount mechanism can be adjusted to fit a wide variety of lens in different diameters as well. The gear drive can either be mounted on the right or left to suit your needs whether you’re left or right-handed. All the while, the padding improves the comfort of use and the swing-away mechanism ensures speedy lens changes. 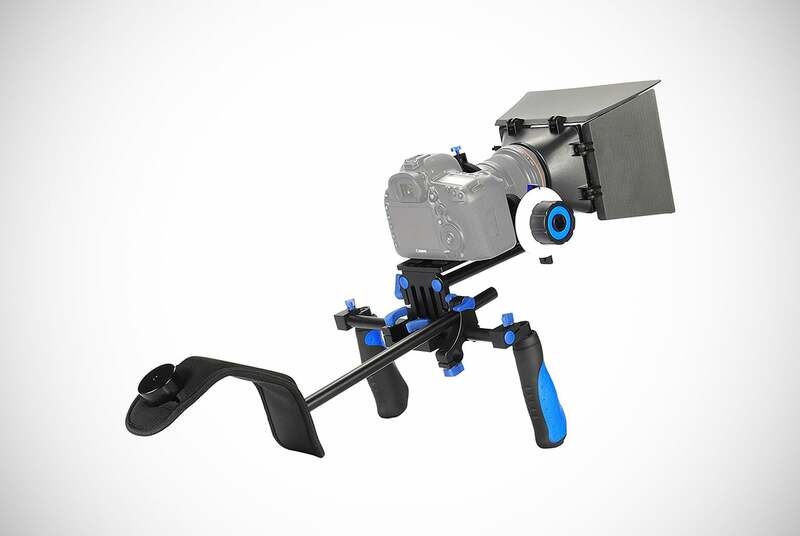 If you have very shaky hands, the Morros DSLR rig movie kit is the ideal solution. With its low price tag, it’s perfect for amateurs who want to take their filmmaking up a notch. Meanwhile, pros on a budget will love it too. With its versatile and durable design, it even has a focus flow knob for precise control focus and optimal results. Despite its relatively low price tag, the Morros rig is built to last with an aluminum heavy-duty frame which is robust but lightweight. It is also designed to be corrosion and rust-resistant for outdoor use. Its gear-driven, innovative design means impressive accuracy. You’ll enjoy repeatable focus movements that improve your footage quality. The non-slip grip on its three handles and adjustable slide-mounting design makes it even more effective. The ¼” thread also means that these DSLR shoulder rigs can be attached with ease to any tripod for even greater flexibility. There’s no need for any of the DSLR shoulder rigs to be heavy or bulky in order to offer optimal stabilization camera. The Movo SG100 mount is easy to maneuver and helps you to save energy during a long day of shooting. With its well-balanced and lightweight design, these are some incredibly sturdy DSLR shoulder rigs that are suitable for use with virtually every DSLR. Eliminating hand-shake admirably, it boasts a cushioned handle and shoulder pad for even greater comfort during long periods of use. Thanks to its heavy-duty aluminum construction, this advanced support rig is very durable and capable of supporting weights of up to 5lbs. Making sure there are no worries about breaking or bending. This model also comes complete with an SGW-5 counterweight to add more stability. The Jag35 KSRV2 camera rig boasts active stability control for even better results. Paired with a full 2-rod counterweight system, it offers two sturdy yet wide handles. Overall, this combines for the perfect footage! Thanks to its intuitive design, these DSLR shoulder rigs allow the operator to get to grips with the equipment quickly and easily. Despite its ease of use, it boasts plenty of impressive features. The two-rod back section ensures there’s plenty of space for attaching all kinds of accessories without affecting the balance of the rig. The front of the rig stays uncluttered so you’ll be able to easily focus on the target of your filming. It also allows for quick lens changes and easier camera operation. With its tall and well-balanced top handle, it’s possible to easily capture low angle shots. 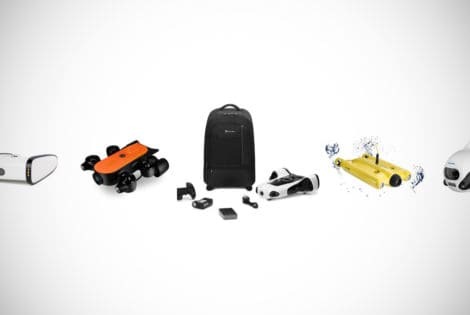 Thanks to its versatile design, it can be easily customized, rearranged, or upgraded to suit your individual filming needs for every project. It’s easy to smoothly tighten to rails or to remove and add handles as necessary thanks to the array of configurations that this rig makes possible. The surface is incredibly smooth and capable of us with any brand of rods. Since the knobs are also machined for a stronger, tighter grip, you can ensure the most durable and rigid rig. To top it off, since it is a single knob system, disassembling and assembling your equipment is speedy and efficient. If you’re looking for convenient DSLR shoulder rigs capable of being customized to meet your individual shooting requirements, the Ikan Cinefly is ideal for you. Its non-slipping metal rosette system ensures that the handles are very simple and quick to adjust. This allows you to bring your arms closer into your body so you can guard against fatigue during long periods of use. This rig comes complete with the Ikan BlackMagic cinema camera baseplate that features well-placed exhaust holes to ensure optimal airflow. This can guard against potential overheating that could cause damage to your equipment. 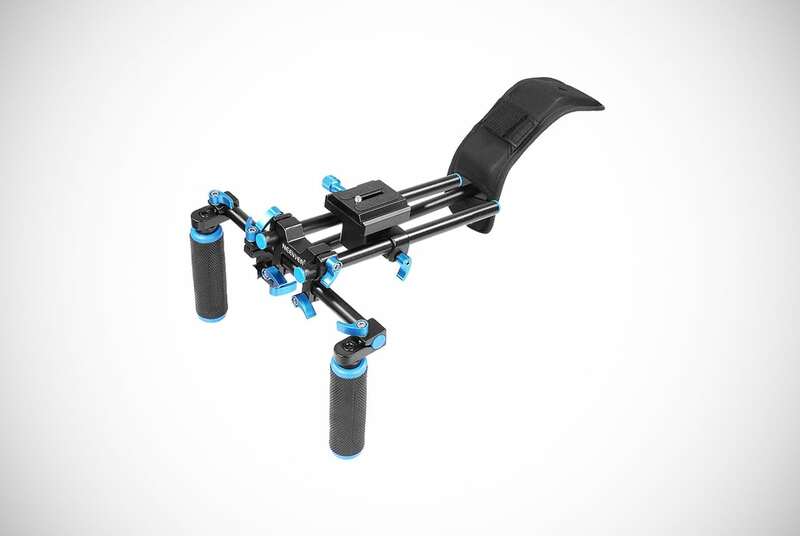 It can also be used with the Ikan DSLR baseplate for even greater versatility and convenience. It’s surprisingly lightweight, despite the sturdy construction. 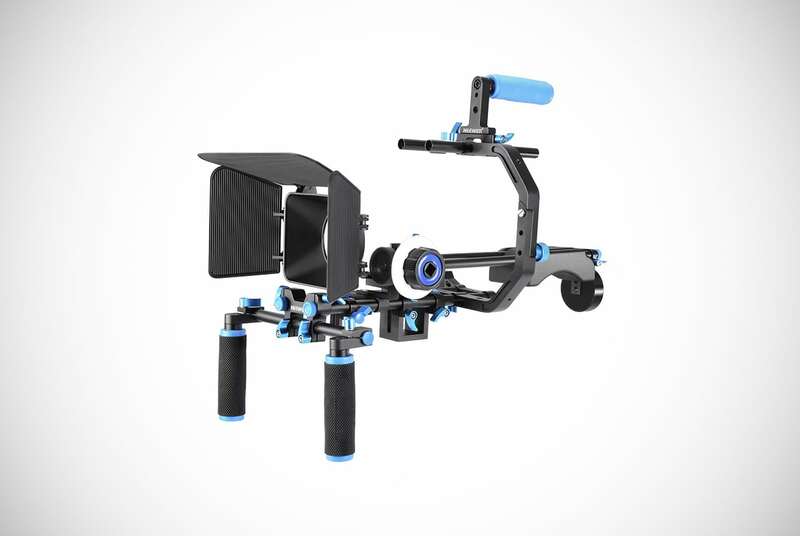 It’s designed with cinematographers and filmmakers in mind, as they need quality products yet affordable pricing. This rig guarantees a solid construction together with impressive reliability for outstanding performance. Designed for speed and ease of assembly and disassembly, this rig works perfectly with any brand of DSLR or any other small cameras. Its small baseplate features tension knobs which are fully adjustable for high-quality, stable shots every time. Its heavy-duty grips paired with the 18” rod system means that adding all the accessories you need will be simple. Durable with outstanding build quality, the FilmCity DSLR shoulder rigs will give you all the professionalism you need at a price that even an amateur can afford. With its stylish and sleek appearance, it boasts a number of handy features that will take your filmmaking to the next level. Its quick release plate is a convenient addition, taking it a mere few minutes to set up and disassemble your equipment. Its shoulder support pad is very comfortable, allowing you to film for extended periods without suffering from any strain or pain. Meanwhile, the inbuilt counterweight ensures that you’ll be well balanced and stable. This is the perfect piece of equipment for a run and gun shoot and offers outstanding value for money. Even though it is very lightweight to carry, it is surprisingly durable. Its adjustable brackets can be moved from 6” up to 9” to suit your requirements. The inclusive matte box is also capable of accommodating lenses of several sizes, up to a maximum of 95mm to suit a range of needs. It also has adjustable top and side doors as well as 4×4 filter holders and a front-located height adjuster for even greater convenience. Stop us before if we’ve mentioned the impressive Neewer DSLR shoulder rigs. Chances are, you won’t be disappointed by this product. With its durable and versatile design, this mount improves the quality of your video for even more professional filmmaking. Designed for use both indoors and outside, this DSLR shoulder support rig has a sturdy construction that retains its shape perfectly. This is regardless of which brand of camera you use. Suitable for both camcorders and DSLRs, it’s very versatile and flexible. 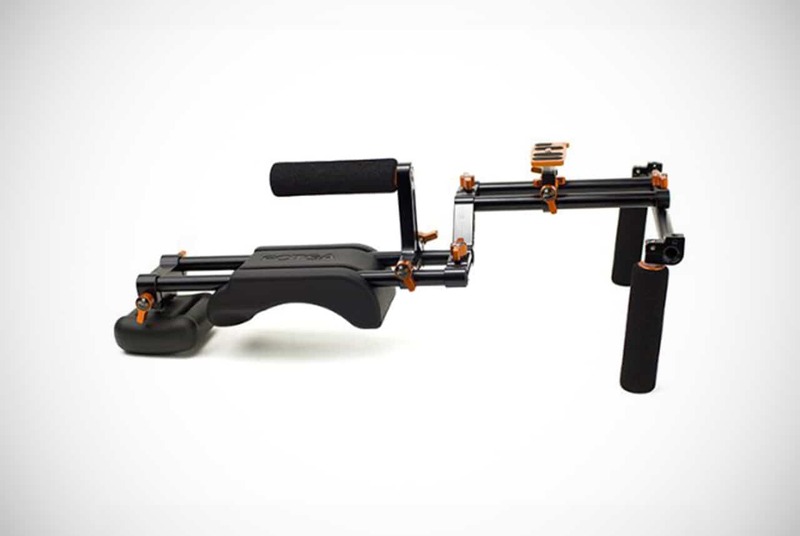 Lightweight enough to take anywhere, this maneuverable rig is comfortable and won’t strain your wrists or hands while you shoot video footage. Both hands have been equipped with a rubberized non-slip grip for extra comfort and support. Meanwhile, the angles and position of the rig can easily be adjusted to improve your video quality. Very customizable, these DSLR shoulder rigs feature a C-shape holder that supports the vast majority of add-ons and accessories like lenses. That means you’ll get even more use from your rig. Its aluminum construction is robust and long-lasting yet surprisingly light, and it won’t break or bed over time. The Tilta TT-03-TL DSLR shoulder rigs come complete with a follow focus and counterweights making it a great option if you’re looking for value for money. 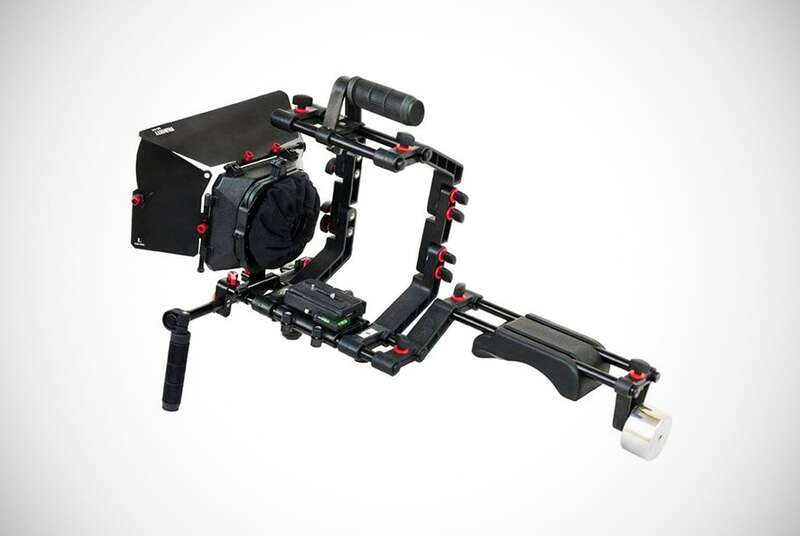 Built with the needs of professional cinematographers and videographers in mind, this rig offers quality at a surprisingly low price. Extremely reliable, it has been designed to be solidly constructed and it boasts every essential feature to guarantee a professional level of performance. 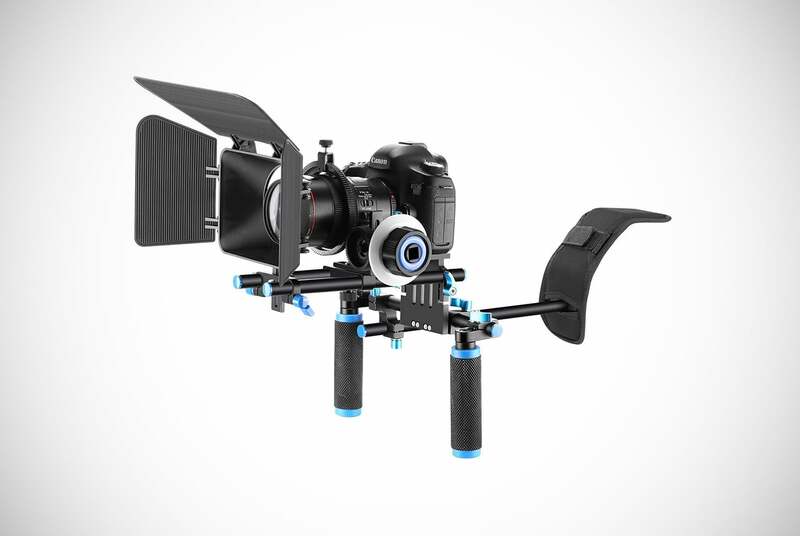 It comes with a baseplate designed for use with DSLR cameras as well as a follow focus that has adjustable hard stops. 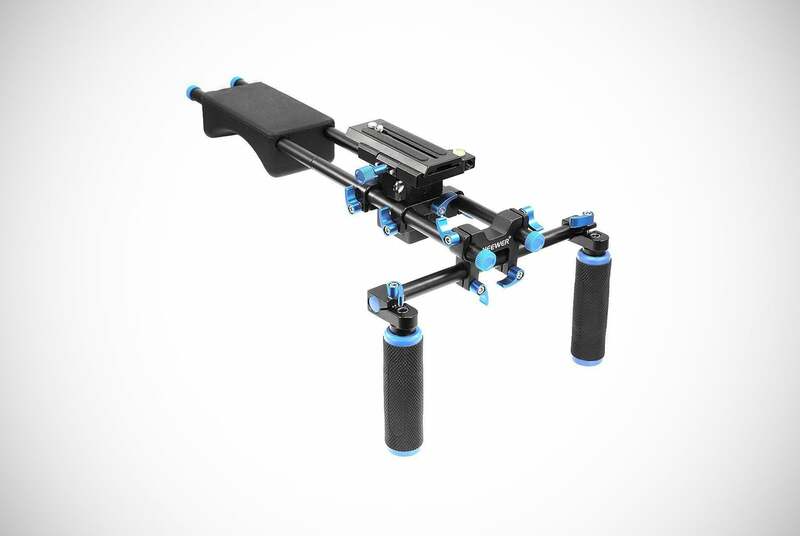 Compatible with virtually every DSLR camera, this rig’s baseplate can snap quickly onto its 15mm support rods for a removable registration pin. This keeps the camera firmly in place and stable during filming. The inclusive follow focus simply snaps onto the rig, while its adjustable tension controls and adjustable hard stops ensure completer precision focusing that works perfectly with a photo-type lens. It also features two counterweights with a 15mm rod adapter to mount onto the rear of the rig allowing the weight to be evenly distributed. This ensures perfect comfort even during a long day of filming. 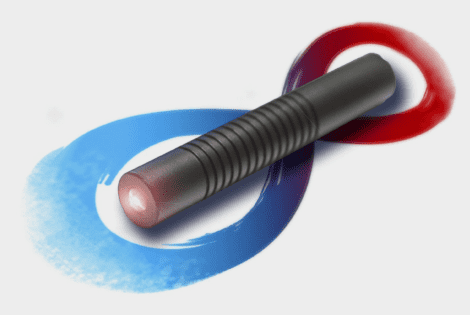 To guarantee this further, the rods have mounted handgrips that can be adjusted through three different points and feature texture for a sturdy and solid grip. You’ll also benefit from a carrying case that comes free of charge with this rig. This makes it a breeze to transport or store between uses. Coming from the Neewer brand, these robust DSLR shoulder rigs come with everything you need to get started with filmmaking. It comes complete with the shoulder mount, matte box, follow focus, top handle, and C-shape bracket. Designed for use with mid-sized and small cameras, they’re perfectly compatible with your DSLR. Plus, this model boasts with features that can help lead to high-quality shots. The extremely affordable price tag makes this a great cost-effective option for beginners who are making their first jump to filmmaking. The inclusive C-shaped bracket features a top handle grip that can transform the rig into a hand-held, which allows for filmmaking on the go. It comes with an inclusive counterweight, which distributes the rig’s weight to better the stabilization and balance. You can adjust the height of the matte box by up to 45mm to suit your camera’s lens size and it can also work with a standard 15mm rail for extra flexibility. The inclusive follow focus allows for more precise shooting and focusing as well, making shot options endless. The soft shoulder pad ensures complete comfort of use, even for extended periods. Meanwhile, the dual-hand handgrip is comfortable to use all day long. Quick to assemble and disassemble, this user-friendly rig is ideal for people at any stage. If you’ve decided you need a shoulder rig, congratulations! To us, it’s the perfect way to get the best footage and shots possible. We feel one of these DSLR shoulder rigs we highlighted above will do the trick. Designed to take all of the hard work out of shooting, a shoulder mount will take the weight for you and eliminate all the problems associated with hand-shake. Never again will you need to worry about the jitters after that super-strong espresso before filming! Whether you’re a filmmaking pro or you’re just an amateur starting out on your shooting adventure, it doesn’t matter. 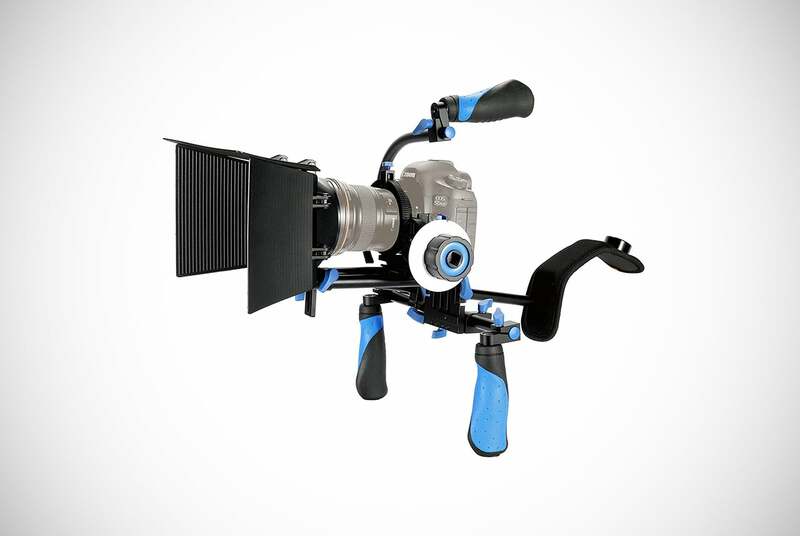 One of these high-quality DSLR shoulder rigs may turn you into the next Steven Spielberg! You’ll love the convenience these rigs provide, especially due to their ability to work both indoors and outdoors. On a low budget or capable of spending a little more on your filming equipment, you’re sure to find a shoulder mount among our top 13 selection to suit your individual needs. We’ve done the hard work for you. We’ve brought you all the key information you need to make a well-informed purchasing decision and avoid making an expensive mistake. Whatever suggestion we threw out that best suits your needs, you can be convinced that you’ll be benefiting from great quality and excellent value for money. It’s time to make a snap decision! Panasonic shows off Wear Space, a wearable device that supposedly helps you tune out the rest of the world and focus on thinking clearly.